An MP has called for a competition inquiry into whether Liverpool's cruise ship terminal should be allowed to compete against Southampton. The government is deciding whether to allow Liverpool to have the same cruise base status as the south coast city. It must approve the plan because a £9m EU grant helped pay for Liverpool's £20m cruise liner terminal, whereas Southampton is commercially-funded. Chris Huhne, a Hampshire MP, wants an EU Competition Commission inquiry. In his letter to the European Competition Commissioner, Mr Huhne wrote: "There is now a proposed change of use by Liverpool City Council for the Liverpool City Cruise Terminal which would allow it to compete, having had taxpayer funding, with the facilities which are commercially-funded in Southampton. "I am writing to ask whether you can please exercise your influence to ensure that unfair subsidies are not paid in this case." Associated British Ports (ABP), which owns the Port of Southampton, says the EU money amounts to unfair help. Liverpool City Council said between 25 and 40 liners could be expected in the city each year if the plan went through. This was about 4-6% of the market, which was worth between £6.6m and £10.6m, a spokesman said. 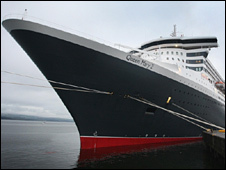 Councillor Gary Millar, Liverpool City Council's executive member for enterprise and tourism, said: "We believe that the creation of a full turnaround facility at Liverpool will benefit the cruise liner industry in the UK, as the city is uniquely positioned to attract business from outside of Europe. "The application to the DfT [Department for Transport] has been made in response to calls from the industry and passengers and the city is keen to build on the success of the facility so far."